Searching for blankets in Lesotho | Oh, the Places We See . 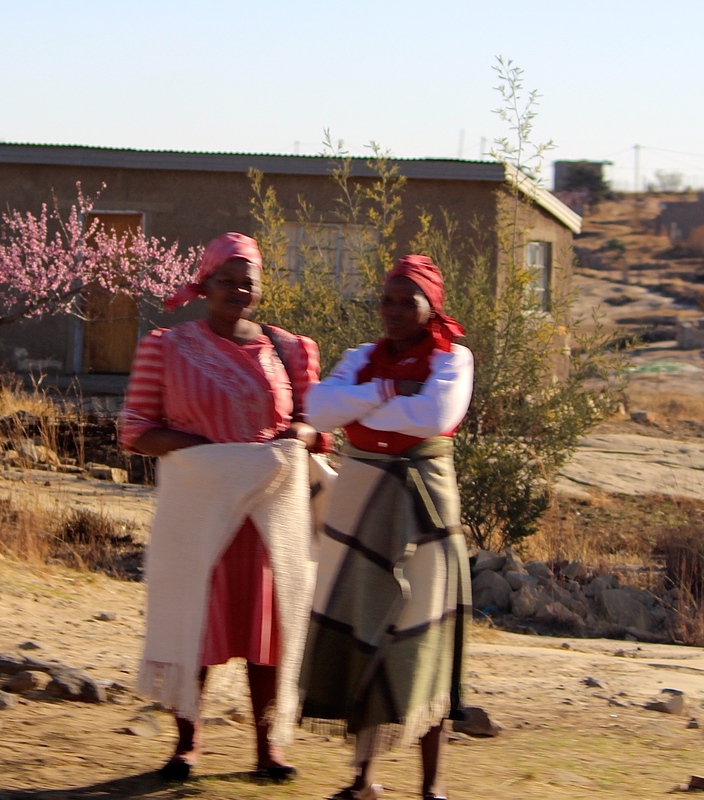 . .
Two Lesotho women with blankets wrapped around their waists. Ask any woman who travels this one question: What one thing do you love to do when you travel? And what you’ll hear is almost universal: SHOPPING! At least that’s how it was among all the women (including me!) on our recent Habitat Global Village build in Lesotho. And we knew what we were looking for even before we left the States. 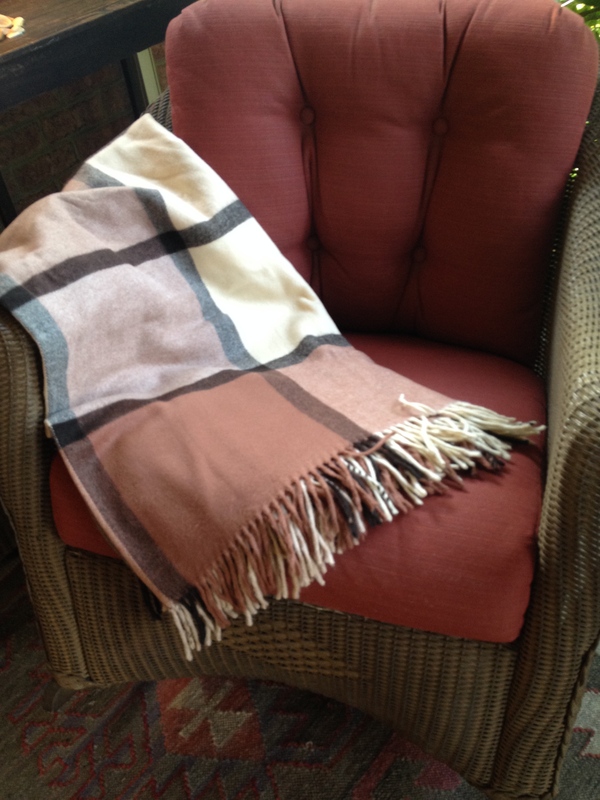 After perusing brochures, newsletters, and pictures of Lesotho, we spotted the one must-have of the trip: a blanket! 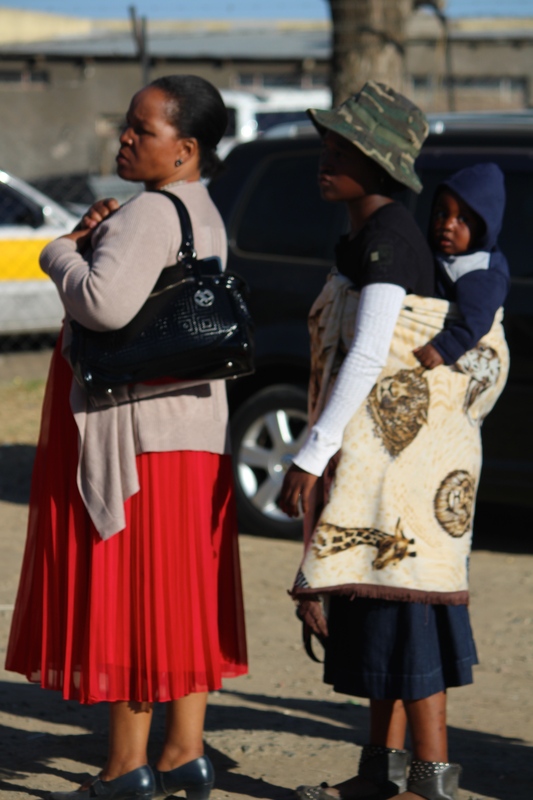 You see, whenever we saw women in the Lesotho pictures, we also saw blankets — wrapped around women’s waists, cuddling infants in blanket slings, and warming up shoulders in cool morning hours. Plaid, paisley, plain — it didn’t matter. We just wanted to make sure we had some spare shopping time to bring home a Lesotho blanket. 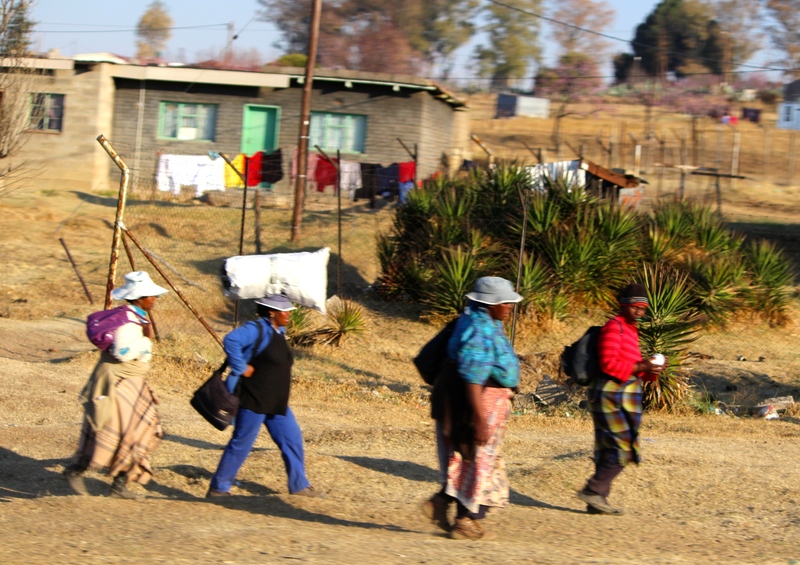 People walking along the street in Lesotho – some with blankets wrapped around their waists. On our second morning in Lesotho, though, we heard the news: the U. S. Embassy had ordered the evacuation of all Americans from the country. So, we looked mournfully at our Global Village liaisons, asking if there would be any time to shop. No sooner had we mentioned a possible excursion before evacuating, our hosts manned a bus, taking us into town while the others (men, mostly) waited for evacuation plans to unfold. As you can guess, there is no direct route to blankets — but the hunt is just as good as the find, if you know what I mean. We began at Setsoto Design in the village of Teyateyaneng, where ladies sit on the floor (some wrapped in blankets, of course) weaving intricate tapestries. Following a paper pattern hung almost ceiling height, weavers take the tiny bundles of colored mohair (from angora goats in Maluti Mountains) and move them those bundles in and around and through the vertically positioned strings, replicating the designs on paper. Nimble fingers. Fierce concentration. Long hours of sitting. Utilizing many colors at once, this weaver works from the small picture to her left. Next door, an elementary school had spilled its precious children all dressed in uniform into the playground to do what children do best: play! We were a bit surprised at how the kids gathered ’round, wanting their pictures taken, and then asking us to reveal the photos as they giggled and pointed at themselves on our cameras. 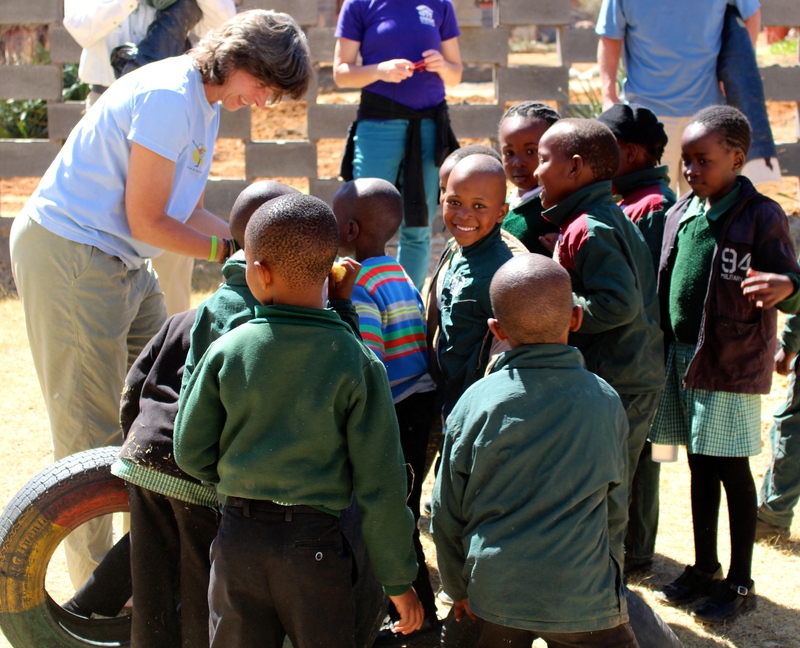 Kim Kreitner (Baltimore) shares her pictures with schoolkids in Lesotho. And we loved it — later commenting that kids are kids no matter where they live. Thank goodness for naivete and smiles and unplanned joy. We passed storefronts selling everything from oranges to pop — kind of like America’s farmers markets or flea markets or newsstands back home. 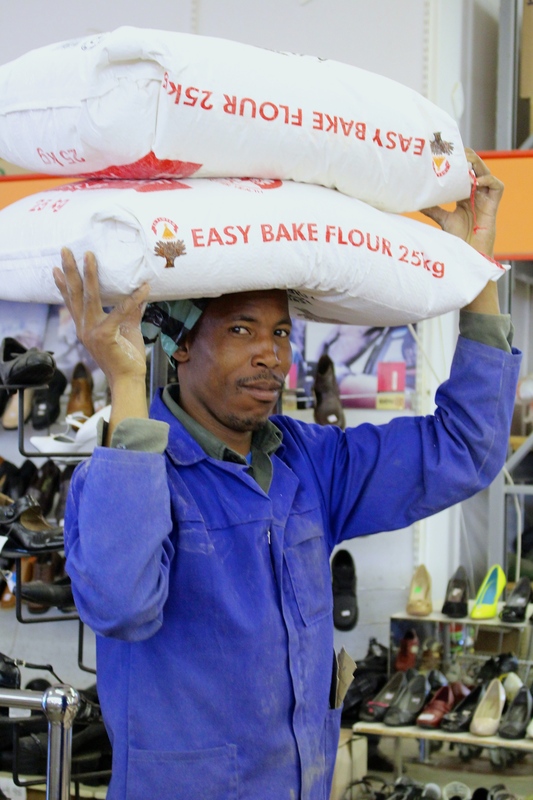 Temporary store in Lesotho? Perhaps. And saw more women with blankets — this time in real life rather than on the internet. But when our guides led us to the general store, we knew we’d hit the jackpot. Stacks of colorful fabric lined the shelves. And neatly folded blankets stood knee-high on the floor. And we struck up conversations with salespeople, folks in the check-out lanes and men carrying heavy loads on their heads. Now back in Tennessee, Bert and I are spending cool fall evenings wrapped in blankets found halfway ’round the world. 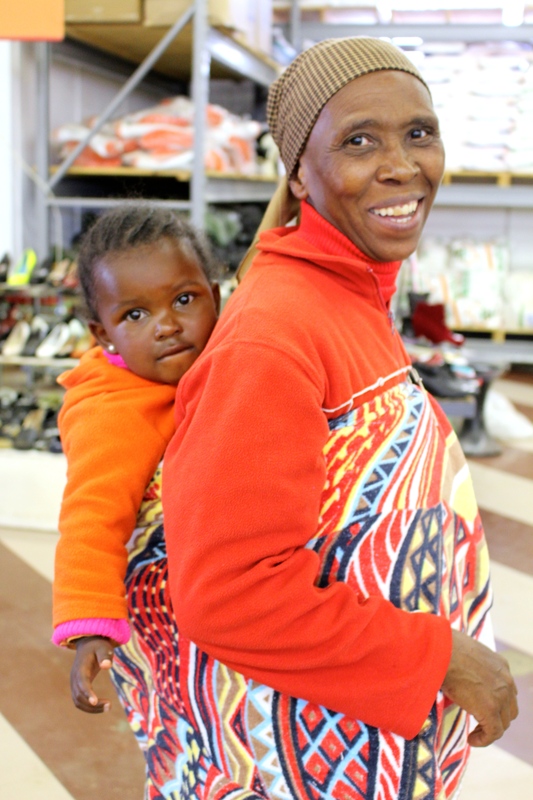 Ah, it’s great to be a shopper in Lesotho! 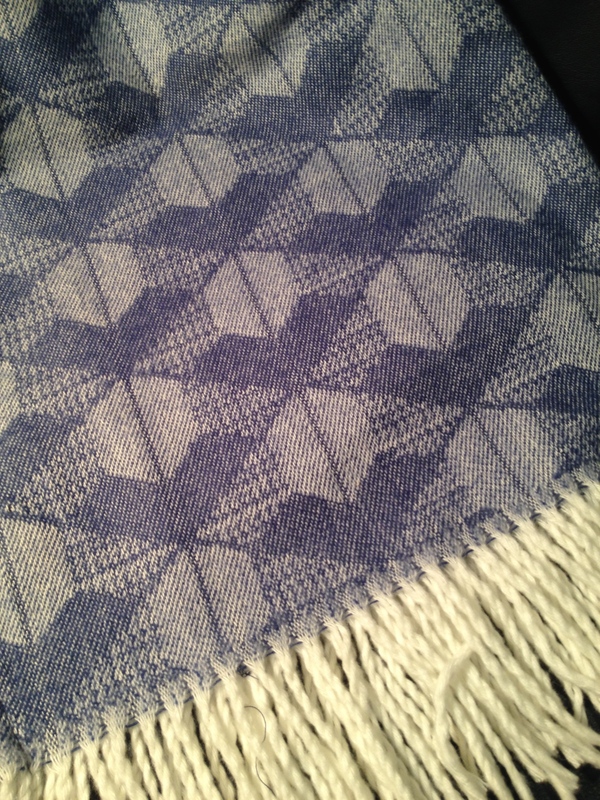 My very own plaid blanket from Lesotho! For more of our travels in Lesotho and South Africa, check out the Page at the top of this blog. Thanks! 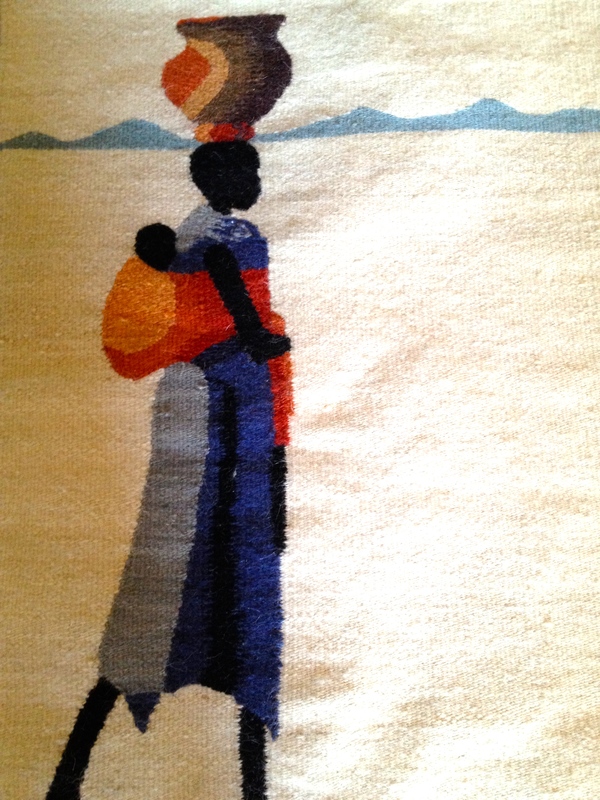 This entry was posted in Lesotho, Retail Shops, Travel and tagged blankets, Lesotho, mohair, schoolchildren in Lesotho, Setsoto Design, tapestries. Bookmark the permalink. Thanks so much for your lovely comments. We absolutely fell in love with Lesotho. Just wish we could have stayed longer. My blankets purchased there are a fond memory! Wonderful post! Love the narrative and photos. Such a pleasure to read your blog! You’ve made my day! It was a joy to be in Lesotho even for such a short time. Glad you could share the story with us. Wow Rusha! I would have been right there with you shopping. Love the tapestry you bought. That is simply divine. And your photo of the young boy is wonderful. When my SIL visited South America I asked if she could bring me back something colourful. On her first trip she brought me back a blanket that is now used all the time by anyone sitting on the couch when it is cool. On her second trip she brought back a gorgeous, brightly coloured shawl and some dolls. I only wish I could have been there in the stores with her to photograph it all. You know, sometimes we love something we bring back from a place just because we want to remember the place. Your story of the blanket and shawl are quite familiar to me — I have several things that we just keep around for the memories! I, too, wish I had taken more pictures. I’ll probably never return to Lesotho, and I want to remember it always. Thanks for reading and commenting! We love all our purchases. Word to the wise, however. Shipping them home may have cost as much as what we bought! But to us, it was worth it! Thanks for reading.